Pretty soon, you'll no longer have to be a handsome, rich celebrity like Christopher Mintz-Plasse to take helicopters to airports. 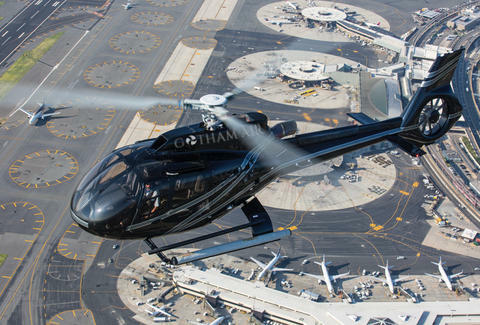 A new service called Gotham Air is offering first-time users six-minute flights from Manhattan heliports to and from either JFK or Newark for just $99, and despite the shockingly low price, they promise they'll even put fuel in the thing and everything. The company plans to start choppering app-booking users all over the place beginning February 9th, Gotham Air CEO Tim Hayes told Thrillist. How it works isn't quite as simple as just having a c-note and a desire to pretend you're on The Bachelor, though. You have to be able to get to one of these three Manhattan heliports: Downtown/Wall Street Heliport (JRB), West 30th Street Heliport (JRA), or East 34th Street Heliport (6N5). And flights are only confirmed once four people have booked the same time and destination; if the flight doesn't fill, it doesn't fly, and passengers with reservations won't be on the hook for the cost, Hayes said. More catches! After the first $99 flight, subsequent flights will run between $199 and $219, depending on the time -- which means you've gotta cram yourself full of even more hors d'oeuvres and booze that'll be waiting in a VIP (you automatically become one of those the very second you take any helicopter to any airport) lounge at the heliport. And as a back-up plan in the event of crappy weather, they've got fleet of Tesla S sedans ready to drive passengers to the airport instead of flying. Elon Musk couldn't be reached for comment on that, because he's in space or something. Tony Merevick is Cities News Editor at Thrillist and wishes there was a service that could fly him to work every day — for free. The subway will continue to do, though. Follow him on Twitter @tonymerevick.